Moll (Jessie Buckley), a troubled woman living in an isolated community, finds herself pulled between the control of her oppressive family and the allure of a secretive outsider suspected of a series of brutal murders. A serial killer is hunting young women in a small, isolated community. In the absence of solid evidence, everyone is a suspect. Tensions reach boiling point as fear and suspicion spreads. The above synopsis could be used to describe any number of movies. Cinema is, of course, packed full of deranged monsters who prey on the innocent. What sets Michael Pearce’s debut film apart is its focus. Beast is not about the hunt for a killer, it is a dark and unsettling exploration of a very troubled woman. Moll inhabits every frame of this gripping story. This is a stunning, star-making performance from Jessie Buckley - one of the very best of the year. She conveys all of her character’s complex and conflicting emotions. We root for Moll even as we feel unnerved by her. Often filmed in overwhelming close up, we feel Moll's frustration, loneliness and desperation. Stifled by an overbearing mother (a brilliant performance from Geraldine James), she leaps at the chance of freedom and love with mysterious stranger, Pascal Renouf (a perfectly balanced portrayal from Johnny Flynn). Throughout Pearce’s disturbing (horror-inflected) fairytale, we wonder - who is the beast in this story? Is it Pascal? Is it Moll or, perhaps, her mother? The islanders? Or, more interestingly, is the film suggesting that there is a beast in all of us? As well as being an utterly gripping mystery, Beast is also a fascinating look at the ridiculous rules and customs small communities (and society in general) cling to in the face of devastating chaos. Young women are being murdered, but the lawns are immaculate and the homes are spotless. There is a serial killer on the loose but woe betide anyone who wears jeans at the golf club. 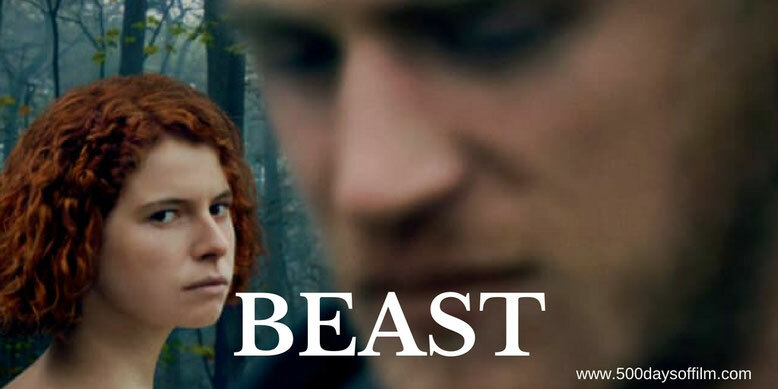 Beast marks the arrival of a very exciting new writer/director and is a must see for Jessie Buckley’s superb performance alone.